A.D.A.M. OnDemand™ is the most comprehensive library of off-the-shelf medical programs. Our team of medical writers, instructional designers, graphic designers, medical illustrators, and subject-matter experts have developed eLearning programs across a number of therapeutic areas. A.D.A.M. OnDemand™ features a wide variety of programs for the health care industry, including basic and advanced learning programs. 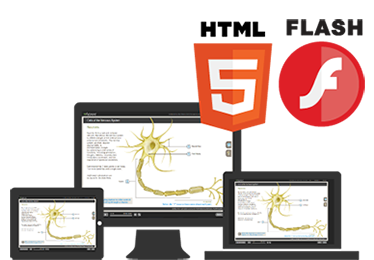 Our award-winning Flash and HTML5 eLearning programs are designed to work across different devices. Our programs are adapted to suit multiple platforms, whether they are viewed on a desktop, laptop, or a mobile device. Easy-to-use and engaging, our Learning Management System (LMS) is integrated into our website, so that you can peruse our detailed catalog, choose your program for purchase, and launch—all in one seamless experience! Get instant online access to our entire A.D.A.M. 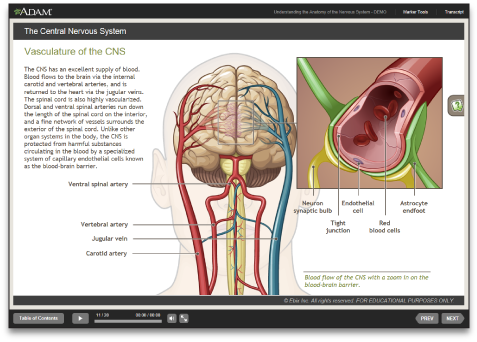 OnDemand™ library of medical eLearning programs—hundreds of hours of content available, without dedicating a single byte on your hard drive! Log in to your account from anywhere at any time. Our cloud-based LMS follows your progress—simply log in and pick up from where you left off. A.D.A.M. OnDemand™ offers the most comprehensive collection of health education programs providing nurses and midwives with the opportunity to meet their continuing professional development (CPD) requirements for national registration. To purchase a program license, select the Add to Cart button that is displayed on all program description pages in the catalog. Once there, you will be guided through the account creation and purchasing process. Once your credit card information is validated, you will be automatically logged in to your newly created A.D.A.M. OnDemand™ account, where you will be able to launch your purchased program. Do you need a multiple-user license for our programs, but you don't have an LMS? We can set up your own URL on our hosted LMS. You'll instantly be able to manage your licensed programs, users, and assignments, and generate reports on user and program activities. If you already have your own LMS, we also sell unlimited-user licenses delivered as SCORM/AICC packages. Visit our Volume Licenses page for more information. Our Flash or HTML5 player will instantly adapt to any screen size and orientation. Whether you are viewing our programs on a desktop computer, laptop, or mobile device our content is adapted to take advantage of your platform. Point and click your way through a vast store of medical knowledge! Our carefully designed interface presents all our program features through simple, intuitive icons that are accessible at all times. Instantly jump to any section with a simple touch. With the Table of Contents available at all times, you're in total control. Display the desired topic of information immediately and intuitively at any time. Access plain-language definitions at all times from our Glossary of Terms. You can listen to the pronunciation of each term by selecting the speaker icon. 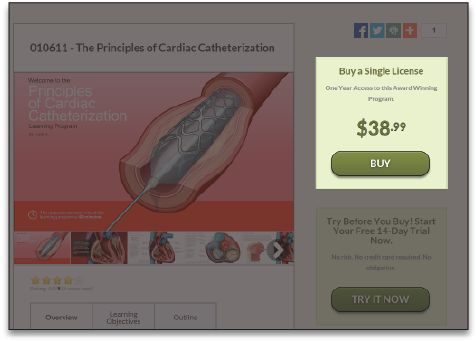 Take full advantage of the latest instructional designs! 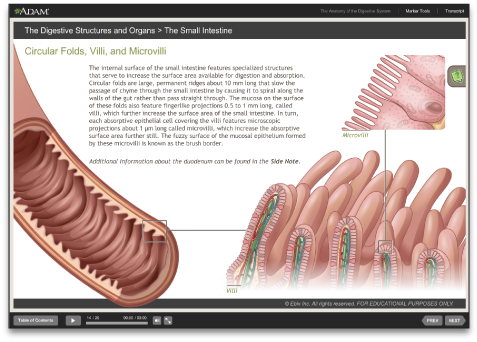 Our eLearning programs are loaded with interactive content—popups, key points, clinical insights, fun facts, and more! Check out our built-in progress tracking. 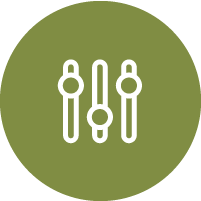 With automated bookmarking, you can easily manage your learning across multiple sessions. Our eLearning programs track your progress. For those who finish the program successfully, a certificate of completion is available for printing! Are you ready to tackle the final assessment? Each program features assessments and quizzes to test your knowledge. Your score will be kept in your learning record. No installation required! 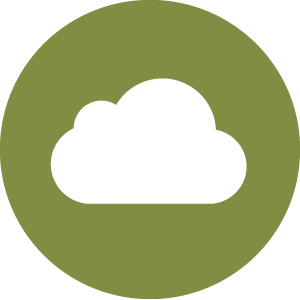 Your programs are online, in your account, in our cloud-based Learning Management System (LMS). Most of our programs are published in both Flash and HTML5, and our player will detect the right version for you. It's all part of the seamless process that offers you the best and most flexible viewing experience. However some of our legacy programs are built in Flash only and will require the Adobe Flash plugin 10.1 or higher to be installed.